Summertime is great for getting out and enjoying the outdoors but it’s also great for hanging out next to a lake and relaxing. There isn’t a better way to enjoy the weather than laying in a hammock, but what do you do if you don’t have the trees for it? The WindPouch Go Inflatable Hammock is an awesome accessory that you can take anywhere and it won’t weigh you down. Hiking or hitting up the beach is a breeze with this lightweight inflatable hammock. It weighs only 2.6 pounds and easily fits in any back pack or beach bag. To inflate it, you simply unroll it and wave it in the air and it inflates in just seconds. it will stay inflated for up to 8 hours and can hold up to 450 pounds and two people! The polyester material is durable, which is good since you’re going to be putting it down on sand, rocks and grass and you don’t want it to rip or tear. It comes with a lifetime warranty as well so that you know you’re getting a great product. 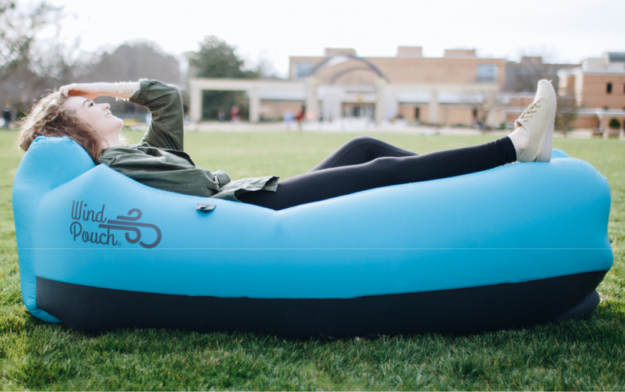 Summer hangouts, beach getaways and just a nice day relaxing by the pool are some great ways to spend some time with the WindPouch inflatable hammock. You can buy yours on their website here or on Amazon.